The Utah State Eastern Eagles men’s basketball team has started to pick up their play as the team won four of their last five contests, three of those victories came against top-25 teams in the nation and defeating the first and second place teams in its conference trying to gain some ground for the conference tournament. 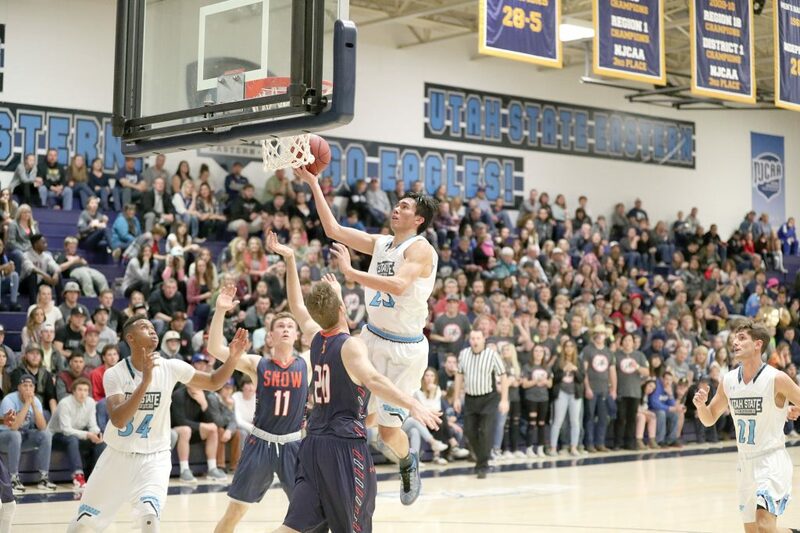 First, the Eagles traveled north to Salt Lake to take on the defending national champions: Salt Lake Community College Bruins on Feb. 2. The Eagles would be down by two heading into the half, 39-41, but eventually held on to take a one-point victory with a final 75-74 score. The team was led by sophomore-forward Roman Mcknight who would do a little bit of everything ending with 20 points, six rebounds, five assists, five blocks and four steals. Sophomore guard Koel Cutler was inserted into the starting lineup with the injury to freshmen-guard Milan Surlic. Cutler ended the game with 17 points while making five three-points-field goals. Two days later on Feb. 4, the team traveled to Rangely, Colo., to take on the Colorado Northwestern Community College Spartans. The Eagles would leave Rangely victorious with a 83-72 win. After the first half, the Spartans would lead 41-37, but the Eagles would outscore the Spartans by 15 in the second half to secure a victory. Once again Cutler would be the team’s biggest contributor, ending the game with 23 points and another five three-point-field goals. Sophomore-forward Cam Bailey would have a good game as he ended the contest with 11 points and 11 rebounds. On Feb. 7, the team hosted rival, No. 14-ranked Snow College Badgers for Eastern’s Fan Appreciation Night. After 40 minutes, the Eagles would end up holding onto a one-point victory, 65-64. Defense was the key for the Eagles as they held the highly efficient Badgers offense to 64 points. Cutler led the team with 12 points while Bailey scored 12 points and grabbed 11 rebounds. Freshmen guard Quinn Peters scored 10 points and grabbed six rebounds. Nico Schapochnik would get the assignment of guarding the Badgers best player, Zach Hunsaker. Schapochnik held Hunsaker to 15 points while going 5-17 shooting. After a three-game-winning streak, the Eagles took on the College of Southern Idaho Golden Eagles Feb. 9. The winning streak would come to an end as the Eagles lost the contest, 96-74. Nico Rojas led the team in scoring with 14 points, nine rebounds and three blocks. Cutler added 13 points in the contest, with Peters adding 11 points and six rebounds. Bailey had a great night with 10 points and 11 rebounds. Valentine’s night the Eagles hosted the Salt Lake Community College Bruins. The Eagles never looked back as they led the contest for the full 40 minutes, not once letting Salt Lake have a lead. The team was short handed with a season-ending shoulder injury to sophomore forward Alex Morell. Even with limited players, this didn’t stop the Eagles as five players for the Eagles scored 15-plus points. Again the team was led by Cutler with 21 points, while hitting five-three pointers in the contest. Mcknight and Bailey would have a big contribution to this victory with Mcknight scoring 20 points and grabbing 10 rebounds while Bailey scored 19 points with 12 rebounds. Peters and Kristupas Totoris add 22 points a piece from the free-throw line as both would go 11-12 from the line. Peters would end the contest with 19 points and Totoris 16 points. The Eagles play their last home game of the season Thursday, Feb. 16, in the BDAC at 7:30 p.m. against CNCC.